Daryll Neita says she’ll put no limits on what she feels she can achieve in Rio as the 19-year-old prepares to make her Olympic bow in the 100m. Neita, one of the newest and most inexperienced members of the Team GB athletics squad, has demonstrated remarkable poise and maturity this season, gradually peaking at all the right moments. When it’s mattered most for the youngster she has produced, clocking two Olympic qualifying times of 11.30 in mid-June before going on to better herself at the British trials with times of 11.23 and 11.24 in the semi-final and final which secured her a second-placed finish and a nailed-on Olympic spot in the blue riband event. Her ability to draw the best performances from herself at the most critical moments has given the belief that she’ll still be moving in the right direction when she steps on to the track in Rio. “I don’t want to leave anything to chance. I know what I’m capable of and a PB is 100% what I’m looking for and just to advance as far as I can go,” Neita said. Remarkably, it was only four years ago that a 15-year-old Neita was having a mini Olympics of her own, running in the London Olympic Stadium at the Sainsbury’s School Games as a test event for the summer’s showpiece. Knowing that she would still be just 19 another four years down the line, Neita’s focus was yet further into the future, eyeing Tokyo 2020 as the year to convert her Olympic dream into a reality. But following her selection into the relay squad at just 18 for the World Championships in 2015 – taken along as the “baby” of the team – Neita realised that qualification for the 2016 Games was a palpable target. Despite being the sprint squad’s youngest member Neita has been handed huge responsibility and will likely anchor an expectant 4x100m relay team in Rio. 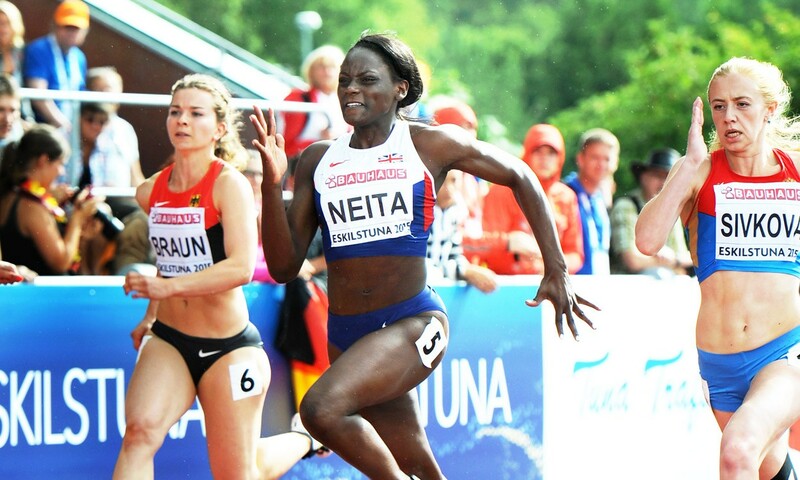 Neita has already enjoyed success on the “glory leg” having brought the baton home for silver at the European Championships in Amsterdam and two weeks later clocking a 41.82 national record in the Olympic Stadium. Boasting a selection of some of the fastest female sprinters Britain has ever produced, the relay squad has big ambitions to fight among the medals. “I’m sure the girls will bring me the baton in a really good position and I can just run home with it. I don’t really feel too much pressure because I’m confident in the girls I’m running with. I want to do everyone proud and just run as fast as I can and run a faster time,” Neita said.